YES. A glorious hamper of cheese. Just for you. Can you imagine such a delight?! 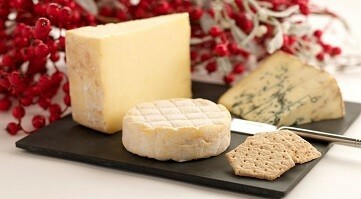 A cheese holiday of deliciousness waiting for you to open it and dive into… yes please!! This year, P&W are truly there for you, with an extravagant range of Christmas Hampers on offer, along with their usual array of blocks, wheels and slices to tickle your taste buds. Prices range from around £30 up to the super luxury hamper at £1,000. I am never going to be able to afford to spend £1k on cheese, but if you can then you bloody well go for it! And grab one for me too. 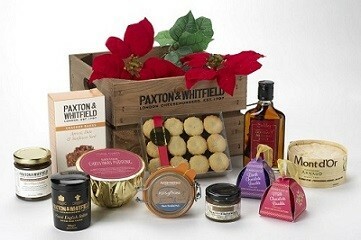 Cheese hampers are great gifts to keep your friends and family chomping away in the days following Christmas and if you buy one with a cheese pot included, then you get a kind-of keepsake too! You don’t want to actually buy physical cheese for a cheese lover? How about getting them a cheese qualification! You can buy them entry to the Academy of Cheese – a cheese training program. run by Paxton & Whitfield and there are 2 bookable sessions in 2018 so far, 24 January 2018 and 23 February 2018. Click here to find out more. Paxton & Whitfield can deliver your order on any day that suits from Tuesday to Friday inclusive. From this you may have figured out that they don’t deliver at weekends or on Mondays so make sure someone is in if you have requested a delivery! Please also bear in mind that Christmas postal services can be a wee bit slower than the rest of the year due to all the generosity and gift sending that’s going on, so please allow at least 3 to 4 working days to take the Christmas busy time into account. With this in mind, the team recommend delivery of your goods (excluding cut cheese) in the week commencing Monday 11th December. All orders containing Ham must be received by 17th December at the very latest.